This summer we have a trip planned for Malaga, Spain. Here is the Malaga wine bar that my brother is taking me to – Casa de la Guardia. You can see “240” written in chalk on his table – that is how much he owes – for now. 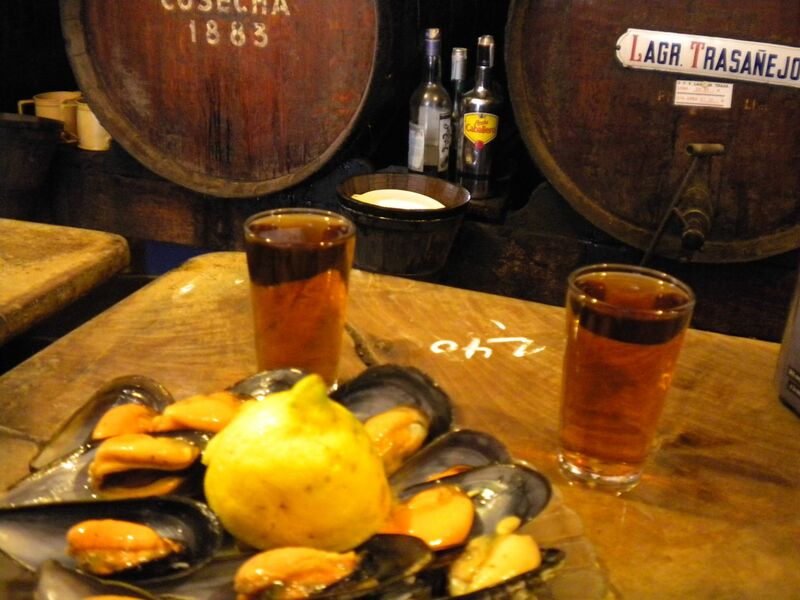 Casks of Sherry in the background, small glasses of sherry in the foreground – mussels too. More on Sherry and Amontillado to come! This photo is posted to keep me focused on the prize. The blog is called pullthecork and yet I have not taken the time to share the best way to pull the cork. There are many ways – the easiest is to use a screwcap but sometimes a cork just seems proper! I have a friend who has pushed the cork down into the bottle with a screwdriver. That works. It’s also a great way to splash wine all over your shirt. I never travel without my Pulltaps Corkscrew. 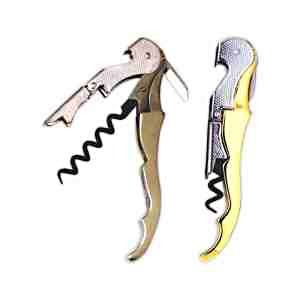 It is simply the best corkscrew ever invented. Double lever arm, Teflon screw, serrated foil cutter, and comfortable on the fingers. It just feels like the perfect fishing rod in your hands – a fishing rod that gets you a glass of wine instead of a fish that still needs cleaning. The Ah-So is a great way to uncork a bottle without damaging the cork and getting bits of cork in the wine. More importantly it impresses a crowd. Rock cork puller back and forth as you push prongs between bottle and cork. When prongs are fully inserted in bottle, pull and twist and cork will be removed. C’est magic. If you have an engineering degree then you may enjoy the tricks of the frightenly complex, yet simple, Rabbit. “Lower, raise, lower, raise” – voila! Personally I don’t like it – it feels like I am using an invention from the industrial age. That’s no way to pullthecork. What can a good Canadian boy learn from the Americans? First of all it’s fair to remind you that I married one. However, right now Thomas Jefferson and Benjamin Franklin are on the top of my list. 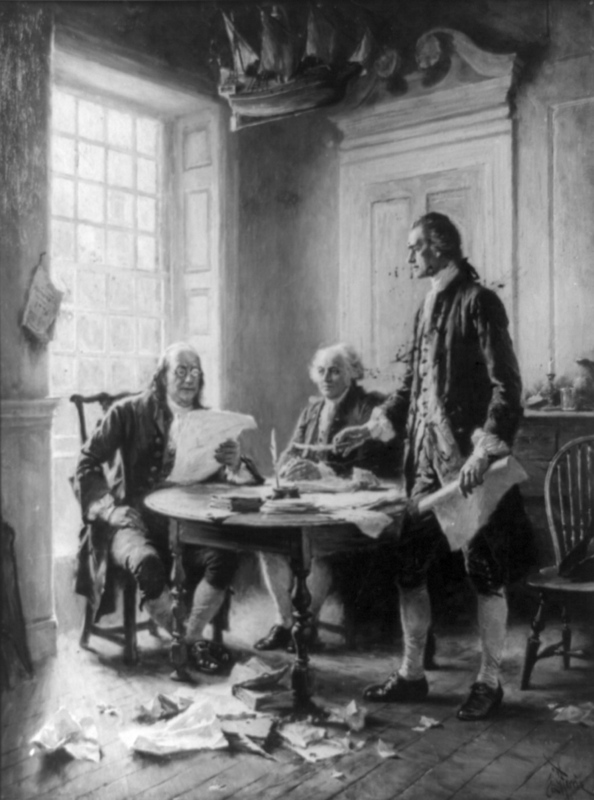 Sure they are founding fathers and there’s the electricity thing too – but let me tell you, those men knew how to start a wine cellar. Thomas Jefferson may have been America’s first wine connoisseur. Can you believe his good fortune at being named American Ambassador to France? I want to be named ambassador to France! Upon arriving in France he purchased 276 bottles to start his new cellar there. Soon his cellar boasted over 250 bottles from Montrachet and Meursault (two great Burgundy towns), and 180 bottles of Chateau Margaux to name a few. Benjamin Franklin had a Paris cellar of more than 1,000 bottles with an emphasis on Champagne. That’s a good start – for your Paris cellar! I have a small cellar. Actually it’s more of a holding spot since the bottle never stay there very long. So what have I learned from these great American men? 1. There’s more to life than discovering electricity and founding a nation. 2. I want to be the Ambassador to France – I think my wife would approve. 3. I hope I get to have a Paris cellar someday – it will have an emphasis on Champagne. 4. If I ever have 180 bottles of Chateaux Margaux in my cellar I will also probably be in personal debt – my wife will not approve. Are you ready for a throwdown? I totally stole that from the “Throwdown with Bobby Flay” show on the Food Network. I love just about everything on the Food Network that doesn’t have Rachel Ray on it. I especially love the food. The only problem with the Food Network is that people forget that food is the star of all the shows (my rant du jour is now complete). For this throwdown (or showdown for my Hockey Night in Canada friends) I have two BC reds going head to head. One from Mission Hill and the other from Prospect Winery. Both wines are marketed as Cabernet Merlot wines and fit in the same price range. Prospect Winery markets wine similar to the Australians – there is a good story and a cool name for each of their wines. Mission Hill Family Estate has more of a Napa style – promoting the wine tourism industry with a great restaurant and fantastic architectural buildings. This Merlot forward wine is rich, bright and friendly – the Cabernet Franc personality comes through nicely. It was a little sharp with the grilled venison but matched nicely with grilled chicken – especially the dark meat. Easy to drink on its own. Advantage – cool name and photo of Haynes Barn. This Cabernet Sauvignon forward wine is strong and structured – Cab Sav is the star in this wine. It poured a little tight but after it relaxed and got a chance to breathe it stood up perfectly with the grilled venison. Advantage – muscular tannins. Tough call to pick a winner since they are so similar. Both are Bordeaux blends with grapes grown in Osoyoos & Naramata vineyards in the same year, and both have been aged in American and French oak for 14 months. I guess the final word should come from my friend Roger – a Parisian who taught me wine lesson number one – “It depends what you are eating”. Isn’t that always the answer? “Zin-fandel, Zin-fandel” (sung to the tune of Edelweiss). Now my wife is mad at me because she will have that song stuck in her head all day. Probably because I will keep singing it all day – a trait I inherited from my Mother. I am in America for March Break (holy days for teachers) and I am committed to the great American grape – Zinfandel. Of course not the white Zinfandel wine that your grandmother drank – this is serious yet relatively simple red wine. In my opinion Zin is the American wine. When I come to PA to visit my in-laws I always drink American and often drink Zin. For my Italian readers, it has been recently discovered that Zinfandel and Primitivo are the same grape – discoveries like that make DNA decoding worthwhile don’t they? Also, it’s the same grape as the Croatian grape Crljenak Kaštelansk, but seriously, when was the last time you asked for a “Crljenak” at a wine bar? 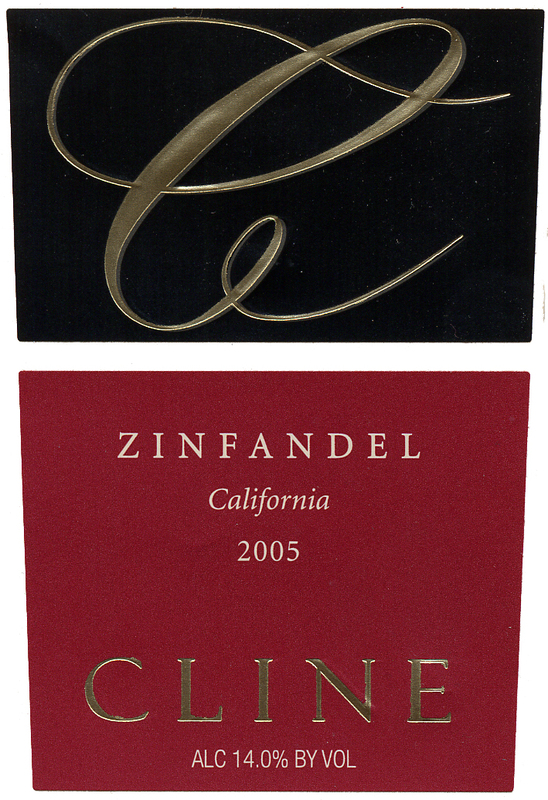 The style of Zin ranges from light Beaujolais to age-worthy Claret and in price from $6 (Barefoot Zinfandel) to $20 (Cardinal Zin). My favorite in the LCBO is Cline. Go out and get a bottle – help rid the world of white Zinfandel stereotypes and ask your favorite Croatian how to pronounce Crljenak for me. J’aime le printemps – and I love the Spring menu at the Red Brick Café. The new food is fantastic – Jessica’s bruschetta is a creation of tomato and herbal magic (but not like the registered trademark herbal magic). Likewise her paprika hummus with veggies is mouth wateringly mouth watering (thanks to Peter Mayle for that one). Try all three wines any night for $10 – then go buy them at the LCBO. This wine has aromas of lime and peaches and has a nice long finish – much longer than a typical Riesling. It is best served cold, for maximum coldness. The producer’s tasting notes mention hints of fennel and honeysuckle. You will taste the honeysuckle more as the wine warms up. Larch Tree Hill stands well on its own and would make a great apéritif – it reminds me of the Olympics – probably because I drank it during the Olympics. I’m just guessing. 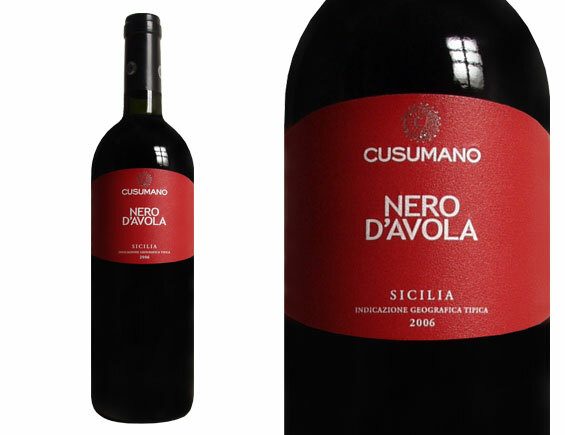 This is why trattoria’s were invented – or why Nero D’Avola was created – its hard to say. Let’s just say that we considered renaming the Café to Red Brick Trattoria and Ristorante after this went on the menu. “Never match wits with a Sicilian when death is on the line” (Princess Bride) but bet your life that people will enjoy this at your next party. At this price you should buy a case. And don’t EVER call this an Italian wine – appearantly both the Italians and Sicilians object to being confused for each other. 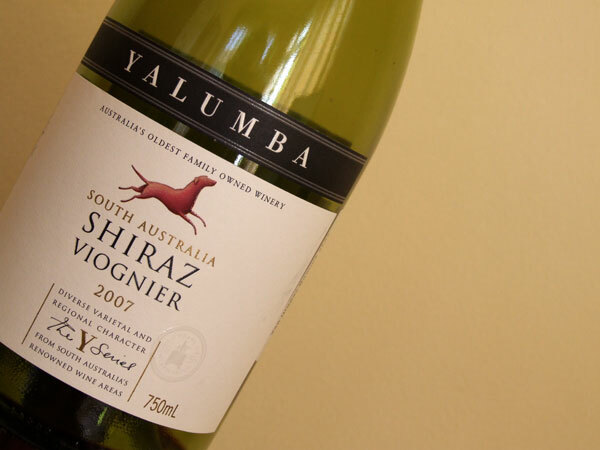 Yalumba Y Series Shiraz Viognier. They have won several environmental awards including the Climate Protection award from the US Environmental Protection Agency. How cool is that – the freekin’ EPA! A blend of Shiraz and a small percentage of white Viognier wine that turns a tough “John Wayne” manly Shiraz into a sensitive 21st century “I’m not afraid to cry at a romantic comedy” wine with softer tannins and interesting floral hints. Spring is here (well close enough, I’ve packed my winter jacket) and so is the new wine and beer menu at the Red Brick Café. Tuesday night is the launch party of the new wine menu (my creation) served with some tasty food (Jessica’s creation). Party starts at 7 pm – yours truly will be there talking up the new wines. If you have never seen owner Shelley Kreiger at a party then you need to come for just that. I can’t let you in on the wines just yet but I can give three hints. A Riesling that is steely and becomes floral when it warms up. A great trattoria sipper from the old country. A delicious Shiraz with a twist. Think about it! And be there if you can.